She'd like to set fire to something other than the rain. 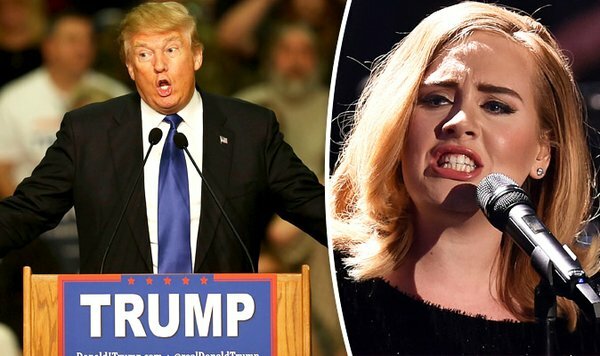 Donald Trump, although you may not know it, is a huge Adele fan. Case in point: he was at Adele’s concert at Radio City Music Hall in November. The guy left the campaign trail to go see Adele — now that’s a fan (or someone who is convinced he’ll win Iowa… sorry about that one, pal). His appreciation for the dulcet tones of Adele is something that has been heard on the trail as well. From “Skyfall” to “Rolling in the Deep,” Trump loves to jam to Adele after he finally takes a breath and runs out of things to say at his standing-room only pep rallies. Ever since he came down the escalators in Trump Plaza, the GOP frontrunner has been playing the British phenom’s music. Trump can thank social media for awareness. With notes like this, Adele had no choice but to put a kibosh on her fans thinking she has anything to do with The Donald. Trump rally is playing Adele while waiting for Sarah Palin to endorse him. Adele can’t write a song sad enough to feel what I’m feeling now. And that’s the end of that. The funny thing is this is not the first time Trump has been told to turn off his rally music. Before people were caucusing in Iowa and New Hampshire, Trump was asking people to “Dream On” following his events. Steven Tyler of Aerosmith wasn’t happy about that. “Trump for President does not have our client’s permission to use ‘Dream On’ or any of our client’s other music in connection with the campaign because it gives the false impression that [Tyler] is connected with or endorses Mr. Trump’s presidential bid,” the cease and desist letter stated. Before that, it was Neil Young chiming in and telling his throng of fans to “Rock in the Free World.” Yeah, well to play Young’s music is costly. “Donald Trump was not authorized to use ‘Rockin’ in the Free World’ in his presidential candidacy announcement. Neil Young, a Canadian citizen, is a supporter of Bernie Sanders for President of the United States of America,” the 69-year-old musician’s rep told E! News in a statement. MEMO to the man with orange stretched cotton candy on his head: Maybe play Zamfir, master of the Pan Flute. He could use the publicity.